The students and staff of +South Berwyn 100 will benefit greatly from having +Drew Minock and +Brad Waid come and train us on the use of +DAQRI Education 4D Studio. 4D Studio is an augmented reality platform that is far superior to those that are out there. I think it is better than Layer and Aurasma both! Drew and Brad arrived in Berwyn on Thursday morning. We toured 1 elementary school and 1 middle school. We are well known for our site visits. +South Berwyn 100 has hosted over 600 people from 10 states over the last 3 years. They come to see our 1:1 program in action. Seeing is believing. We saw an iPad classroom, robotics club, Makey Makey, 6th grade language arts and math Macbook classes. Next we went to a planning meeting for our +iEngage Berwyn 2 day Ed Tech conference on May 8-9, 2015. It was great to have input from Brad and Drew. They have been to many national conferences. 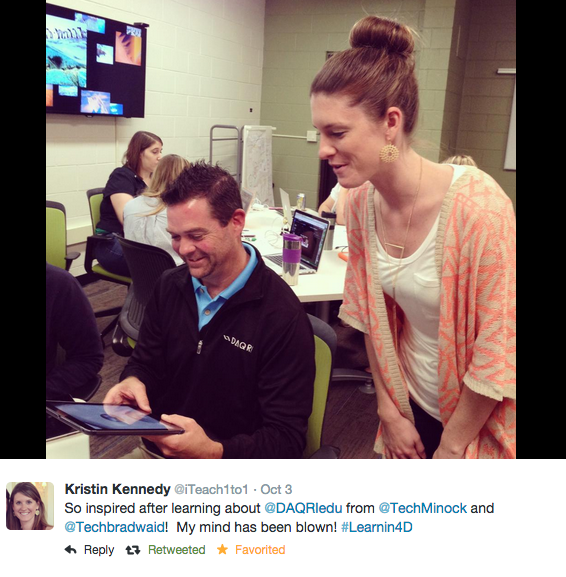 Brad and Drew along with +Kevin Honeycutt and JohnAntonetti will be featured at the conference. Brad's and Drew's input was invaluable. 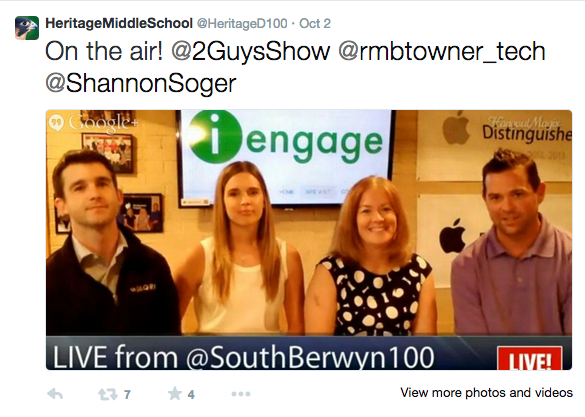 After that +Shannon Soger and I did the 2 Guys Show live with Brad and Drew. During the show we talked about what it takes to have an effective 1:1 program, the power of social media and planning an ed tech conference. It was so much fun to talk about 2 of my favorite things, social media and the great things we are doing in our district. I love my job! It was so much fun doing the show. I hope you can find some time to watch it. On Friday Brad and Drew trained our staff on DAQRI 4D Studio augmented reality platform. Teachers were given release time to attend a half day session to learn how to use 4D Studio and begin to create triggers. We were able to work in our new district professional development room. It is an awesome space for teaching and learning. The first step was to have the team members apply for a free 4D Studio edu license. Brad and Drew demonstrated many of the pre-made DAQRI products, Anatomy 4D, Enchantium and Elements 4D. They had us hooked. We saw the power that augmented reality could have in our classrooms. Augmented reality is fun and it brings things into the classroom that we could not bring in on our own. Similar to the way Skype or Google Hangouts bring experts into your classroom. Elements 4D enables the user to interact with 36 naturally occurring elements. The user can see what chemicals like, mercury, look like on their own, or what the chemical reaction would be if any of the elements were combined. Using the app is sure to bring oohh's and aahh's to any classroom! Next we dove into 4D Studio. Drew and Brad showed us how to use all the bells and whistles that go with 4D Studio. You can find 4D video tutorials here. The best part was that teachers were given time to play and build triggers to use in their classrooms before they left. Teachers are working now to create projects with their students. Primarily lower elementary teachers are creating experiences for their students to use in class on the iOS devices and upper elementary and middle school teachers are having their students create their own experiences to share with classmates. We hope to have some triggers ready to publish soon. It was a great experience for everyone involved and we look forward to the return of Brad and Drew so that we can show them what teachers and students in our district have created.